A decade in, it’s really hard to imagine a time before the App Store. I still clearly remember downloading my first few apps on my O.G. iPhone, which I primarily did for something to do while I waited in line overnight for the iPhone 3G. I’m pretty sure the first game I downloaded was the (now defunct) Super Monkey Ball, but the early App Store launch games that I spent the most time with were Trism ($2.99) and Solitaire City ($2.99). (Solitaire City still being my go-to Solitaire game that I still play today, if it ain’t broke, don’t fix it, right?) Looking back on some of the earliest news on TouchArcade surrounding the App Store is pretty amusing, particularly when reading comments on those articles. It’s not been all fun and games for developers – especially as a games developer. Our iPhone game, “iDrops", isn’t one of the eight featured puzzle games, and so we’re virtually impossible to find on the App Store. After all the effort put into developing the game, it’s very frustrating. Many other concerns about visibility and the featuring process were raised in subsequent articles, which is a problem that still exists today. Regardless, unless you really played your cards wrong, developers who were early to market on the App Store made a killing. I’ve even heard strong arguments that the initial App Store boom is likely the biggest gold rush we’ll see in our lifetimes, which is difficult to argue as (outside of random things like Bitcoin) it’s hard to think of many things where so many people became millionaires from more or less being in the right place at the right time. As more and more developers caught wind of the opportunity on the App Store, the platform was completely dog piled. One of the best ways to get visibility for your game in this era was by putting it on sale, as the way the early App Store algorithms worked you were vastly rewarded for dropping the price of your game and have it rocket up the charts. Naturally, this resulted in a race to the bottom when it came to App Store pricing, as developers effectively trained App Store consumers that if they waited long enough, any app or game they wanted would eventually be 99 cents or free. Long before free to play was even a concept that anyone contemplated on the App Store, rumors began circulating in early 2009 surrounding a “premium App Store" which many believed would be a special section where everything would cost $19.99 and up. Some “additional confirmation" was also provided, but obviously this never materialized. Again, comments on those two articles are also fascinating to look at, particularly as TouchArcade community members reference series like Grand Theft Auto or Need For Speed as hypotheticals of what they’d love to see on the App Store- Two franchises which now obviously have multiple releases available for download on iOS. But what’s strange is that when you run across a $.99 app, you’re never quite sure if you should be happy it’s cheap or annoyed they bothered charging anything at all. App commenters in iTunes also reflect this internal struggle. The biggest change on the App Store that would forever change the course of mobile gaming was the announcement of iPhone OS 3.0, as that is when Apple added the ability for developers to add in-app purchases to their games. Curiously enough, the original policies surrounding IAP only allowed developers with paid games to add IAP to them. 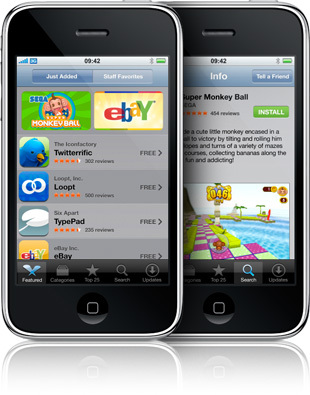 Steve Jobs believed that free games should always be free, as Apple’s notoriously pro-consumer stance reared its head. The idea was Steve didn’t want anyone to feel bamboozled by downloading something that appears to be free, but actually isn’t. This will result in some massive changes to the scenery of the App Store. A number of questions and possibilities arise. Developers could, for example, completely eliminate a Lite version altogether, and simply provide a Free version with the rest of the content as downloadable in-app purchases. This, however, also changes the dynamic of the top 100 lists. Such an app would be ranked only in the Top 100 Free and may never show up in the Top 100 Paid. “Wow, that´s amazing! Now this is more like Xbox live arcade market and is very nice to download the game just 1 time, try it and unlock/pay the full game. Great move Apple!" “How will review websites get money from free demo apps with in-game purchases? Usually they get 5% (4% in europe) for links to the Appstore, but this won’t work anymore. This will cost sites like Touch Arcade thousands of dollars." And, well, it definitely changed the App Store (particularly in terms of games), it definitely (eventually) nuked developers releasing free “lite" versions of games, made it super difficult to compete as an indie developer, and decimated the amount of affiliate revenue TouchArcade generates. The latter still seems super stupid to me, as if someone clicks through one of our links to download Clash of Clans then spends thousands of dollars in the game we see $0 of that, versus a couple pennies on a 99 cent download… But, I digress. …Of course all good things must come to an end, and ngmoco eventually shut down Eliminate a little less than two years later, providing many TouchArcade community members the first taste of what it felt like to be heavily invested in a free to play game that just no longer exists anymore. Following the rise of free to play, the rest of the history of the App Store mostly involves iOS hardware getting more and more powerful which (obviously) allowed for a rapid increase in visual fidelity in games. Early announcements surrounding Infinity Blade (originally titled Project Sword) had our jaws on the floor, we called Id’s Rage a “graphical masterpiece“, and then those kind of things just became normal- Particularly with the advent of Metal in mid-2014 which allowed developers to add ridiculous levels of visual flare to their games. In modern times, the trend we’ve been most impressed with is games that feature complete cross-play with PC (and often times console). Blizzard’s Hearthstone was among the first massive cross-play games I got into, but looking at the unbelievable success of PUBG on mobile, and the straight up ridiculous amount of money Fortnite is making, I think this is a massive trend we’ll be seeing in the future. Many people have scoffed at the idea of complicated FPS games like PUBG and Fortnite being playable on a touch screen, but I’ll leave you with the following thought: There was a time where nearly every PC gamer turned their nose up at the idea of ever being able to play a first person shooter without a keyboard and mouse. Hell, I was one of those people, but massive Halo XBOX LAN parties my friends kept throwing forced me to convert to playing FPS games using a controller- As to many of my friends, who hadn’t grown up with PC games or PC game controls, playing Halo using the default controls was just totally normal to them. With the App Store turning ten, there’s an entire generation of kids out there who didn’t grow up with a controller in their hand (or a keyboard and mouse), instead, all the games they have played have been on a touch screen. For them, the controls of PUBG and Fortnite are totally normal. I’m super curious to see what this means for the future of gaming, particularly as people my age just inevitably get busier with kids, their house, and other things that leads to less time and money spent on gaming, while this younger generation eventually joins the work force and becomes a dominant spending force in the gaming market. While you’re pondering that, imagine this: There’s also kids out there who look at games like Angry Birds or Doodle Jump with the same nostalgia us 30-somethings have towards the NES versions of Super Mario or Zelda. If that doesn’t cook your noodle, I don’t know what will. Anyway, this has been a super exciting decade around here at TouchArcade, and while it’d take an entire book to detail the complete history of the App Store, hopefully this brief look at some of the bigger historical moments (in my opinion, anyway) that massively changed the direction of the App Store was insightful for someone who wasn’t around for the absolutely terrible version of Super Monkey Ball and the many other things that launched on the first day that the App Store was open ten years ago today.